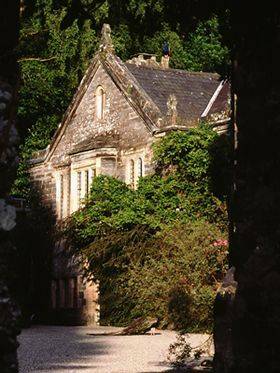 Gwydir Castle is situated in the Conwy Valley close to the historic market town of Llanrwst and the popular village of Betws-y-Coed. Framed by the hills of the Gwydir Forest, Gwydir occupies a commanding position on the fertile flood plain of the River Conwy, on the edge of the Snowdonia National Park. To the South and West, the hills and the mountains of northern Snowdonia are within easy reach. In addition to the renowned beauty and drama of its landscape, Snowdonia offers a wide range of activities for the adventurous, from mountain biking and white-water kayaking, through to riding, climbing and hill walking. As well as its natural historical importance, the area is rich in archaeological and historical monuments of all ages. Of particular note are the famous castles and town fortifications built by Edward I at Caernarfon, Conwy, Harlech and Beaumaris (all within easy reach of Gwydir). In addition, there are fine early churches and much vernacular building interest. Bodnant Gardens (National Trust) are located twenty minutes to the North, and the Victorian sea-side resort of Llandudno is situated beyond the historic town of Conwy, some thirty minutes away. The A55 coast road provides easy access from the Midlands in the East and the port of Holyhead in the West, while Thomas Telford’s scenic A5 links the Conwy Valley with Shrewsbury and the South of England. There are good rail and bus connections to Llanrwst (ten minutes walk away). For precise location details please view the Google map below.